under the guidance of her owner, SPCA volunteer Debra Greenstein. Doug Turner, 8, is not a big fan of reading. His tutors say he'll find any excuse to avoid it, like asking for a water break, forgetting his book or saying he has to go to the bathroom - again. But not on Wednesdays. That's when Dusty and Sophie come to Junipero Serra Elementary in San Francisco to listen to him read. They never giggle, and they never criticize. Dusty is a shih tzu and Sophie a Maltese, and in that canine way, they are Doug's biggest fans. "Children, get your coats on," Doug read from his "Phonics Library" book, "We're going shopping. They roomed ... roamed ... up and down the aisles, looking for gifts." Sophie sat at attention on her owner Debra Greenstein's lap, watching Doug turn each page. Dusty stretched out on a patch of sunlight at Doug's feet. Since 2007, the San Francisco SPCA has been sending therapy dogs and their owners to public and private schools, libraries, and pediatric hospital units to encourage "struggling readers" to open books and give it a try. 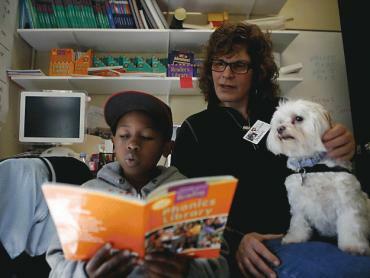 Six students have been reading to Dusty and Sophie since the start of the school year, as one of the many ways educational resource specialist Wendy Fergus is trying to lift their reading levels up one or two grades. "The animals seem to take some of their nervous energy away," Fergus said. "If kids are reading to a dog, the dog's not going to say, 'You're wrong,' they're just going to listen." Doug agreed it's easier to read to a dog. "A person, they get hungry, or have to go to the bathroom, they have to leave and go do stuff," he said. "But a dog, all they do is walk up to you and sit in your lap."